Protect your delicate paint from stone chips! Designed to help protect the vulnerable painted wheel opening edge just behind your spinning tire. 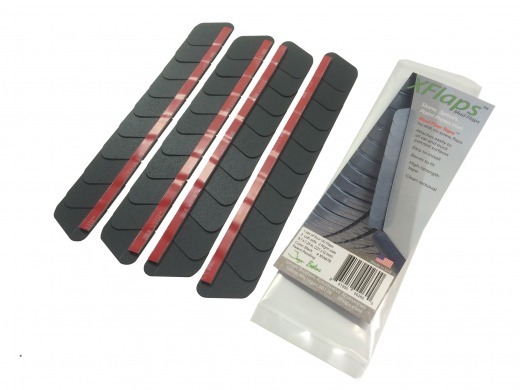 XFlaps revolutionary patented design allows them to fit each cars unique curves. Great for temporary or long-term use. Adding protection to your car has never been easier. XFlaps offer superior coverage and protection compared to clear tape, and are much easier to install than clear tape or traditional mud flaps. 1.25" wide petals x 8.7" length provide excellent coverage for most vehicles. Tough layered 17 Mil Polycarbonate provide superior protection. XFlaps can easily be cut or joined together for custom lengths. XFlaps can be installed flat on most wheel opening flanges, or they can be bent to fit wheel openings without flanges, using the integrated bend line. Simply peel the adhesive backing off of the stone guard and install it on the fender. Our exclusive Patented design allows the product to follow the contours of the vehicle and provide a sleek, high tech appearance. The automotive grade adhesive backing stays put until you decide to remove it. XFlap stone guards are a proven way to protect the vulnerable, high-speed projectile impact zone of your car. Anyone can install these in just a few minutes and feel proud to be extending the useful life and look of their vehicle. Stylish, low-cost, paint protection for your car. - In Stock - Flat $4 shipping to anywhere in the USA. Conformable, stick-on splash guards/mud flaps, revolutionary patented design fits most cars and trucks, made in USA.